The flat area with the buildings is South Wells, commonly called The Tailings. 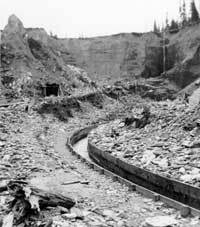 Lowhee Gulch and the large valley near it were created by hydraulic mining, with a water cannon. The giant hoses had so much water coming out of them at such a strong pressure that a boulder the size of a car could be suspended in the air by the water and not touch the ground. These hoses blasted the valley into the mountain and created all the loose rock or tailings that the houses in South Wells are built on.